IFA 2012: What to expect at Europe's biggest tech show | What Hi-Fi? We're off to Berlin first thing tomorrow morning to cover the opening of IFA 2012, the annual consumer electronics show in Berlin. 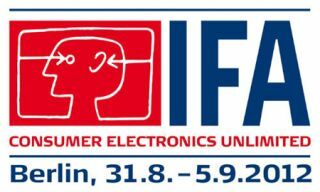 IFA, or the Internationale Funkausstellung to give it its full name, is Europe's largest consumer electronics showcase, with most of the big manufacturers (and some small ones) unveiling their latest products. One of the highlights will be the introduction of the world's first Ultra Definition 3D TVs from the likes of LG (below), Sony and Toshiba, plus the unveiling of a 60in, 2160p glasses-free 3D TV from Stream TV Networks, with a range of tablets, smartphones and PCs to follow using Ultra-D 2160p technology. You'll be able to watch live coverage of the Panasonic press event by logging on to www.panasonic.eu/ifa. You'll also be able to ask questions on the new products launched via the Panasonic website, witth experts on hand to give live answers. And we hope to get our hands on the company's new Android smartphone, as well as catch a glimpse of Titanic on 3D Blu-ray, given that the firm has teamed up with 20th Century Fox to bundle the disc with some of its Blu-ray players. Sony, like LG, is due to join LG and Toshiba in unveiling its take on an Ultra Definition 3D TV, with four times the resolution of current high-definition sets. We also expect to see a new range of Sony Xperia smartphones, plus the arrival of the Xperia Tablet. Let's be honest, the Sony Tablet P hasn't exactly set the world alight, so a new offering is probably on the cards. And will the Tablet S get an update? And we'll be asking what happened to Sony's Crystal LED technology that we first saw at CES in Las Vegas last January( below). Samsung has been in the news lately due to its legal battle with Apple, but that's unlikely to put the ambitious South Korean giant off its stride at IFA. The big speculation is that Samsung will unveil a MkII version of its Galaxy Note smartphone, and we've already got our hands on the improved version of the Galaxy Note 10.1 tablet, which we'll review in the November issue of What Hi-Fi? Sound and Vision (on sale September 21st). Philips has been through quite an upheaval of late, merging its loss-making TV business with Hong Kong-based TP Vision. We may see more fruits of that partnership, as well as some new audio products from Philips itself. We'll also be asking how the Smart TV Alliance between LG and TP Vision is coming along in its bid to persuade other manufacturers to join them in creating a single, non-proprietary ecosystem for smart TV developers. Loewe will unveil a range of enhanced tabletop audio systems and new top-end TV sets, including the world premier of the company's forthcoming flagship TV and AV component system, the Reference ID. We're booked in for a stand tour at IFA. Highlights are expected to include the world's first 84in Ultra Definition 3D TV and the LG Optimus G 4G smartphone with Qualcomm's quad-core Snapdragon processor. So keep an eye open for all our up-to-the-minute IFA 2012 coverage here on whathifi.com.